In this vibrant and unusually large and complex painting, the worshipping supplicant Kakoji Ram, in gold, sits in the centre foreground surrounded by gods, ascetics and other worshippers. Behind them a landscape spreads into the distance either side of a highway-like river of commuting fish, while a herd of elephants marches across the green hills, and in the thundery sky gods float in a golden throne. The quality and intricate detail of this painting is ravishing, rewarding close and lengthy examination. It can be compared to several works attributed to Hyderabad or Bidar in the very late-seventeenth and early-eighteenth centuries; the distinctive Deccani outcroppings of rock in the landscape can be seen in a number of works from the region (for example, lot 46 in this catalogue) and other stylistic traits appear in works including a manuscript illustration of birds in a jungle (see Zebrowski 1983, p.218, no.188); a series of complex Ragamala paintings from early-eighteenth-century Bidar (ibid, pp.226-228, nos.199-201 and pp. 231-2, nos.202-3); a garden portrait of Allah-wirdi Khan from early-eighteenth-century Hyderabad (ibid, p.236, no.209, col.pl.XXII); and, closest of all in style, detail and overall composition, a large and complex scene of a prince receiving water from girls at a well in a landscape setting, also from early-eighteenth-century Hyderabad (ibid, p.241, no.216). For a slightly later example of the tiered crowns of the gods see Zebrowski 1983, p.276, no.256. 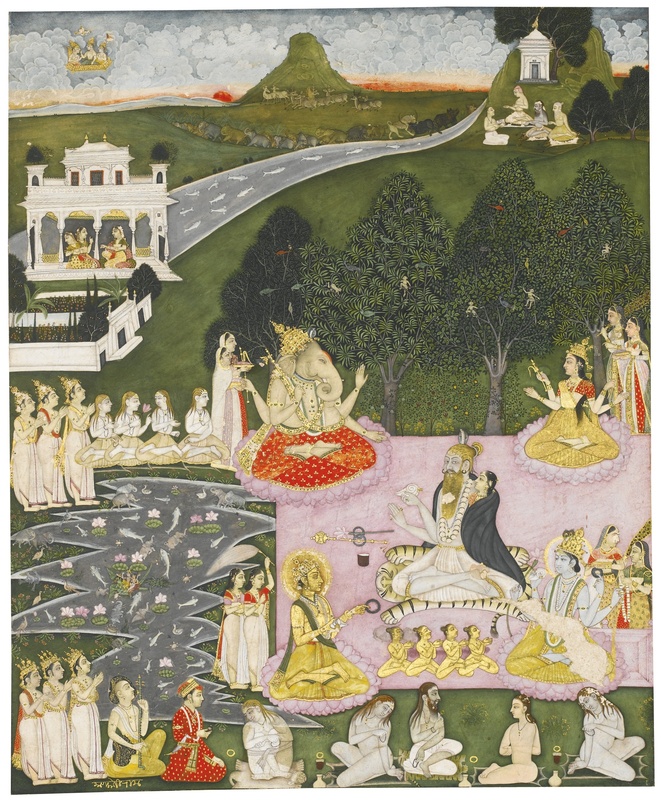 The identification in the Christie's 1988 sale catalogue of the subject as Bhairav Raga was based on an eighteenth-century Deccani Ragamala illustration showing Siva and Parvati in the Kankroli Art Collection, Baroda (Ebeling 1973, p.27, no.C1), but this seems unlikely for the present work, as does the Christie's attribution to Murshidabad.